I wonder why Hélène picked this particular card. And what lies behind her uncertainty about her future? Why are the little boys so badly behaved? What is the story behind her friend’s brother’s homecoming? Is he returning from war or from hospital, perhaps? So many questions. The war has been over for three months: maybe the answers lie there. Excuse me for not having thanked you sooner for your kind wishes but I have been very busy with an over-full class and some very indisciplined small boys. All in all I send you my most sincere, most affectionate wishes. My job pleases me because I like children very much, otherwise I would do something else. I can’t tell you what because I don’t know. I’m like the bird on a branch who looks out in all directions before deciding which way to fly. I will be going to B next week if I am not replaced. My best wishes to your parents and your sister; for you, love and kisses. I hope that your brother has returned in good health and that you have him in person. For the time being, tell him a friendly hello from me. Note: Col de la Chipote is in the Vosges between Baccarat and St-Dié. 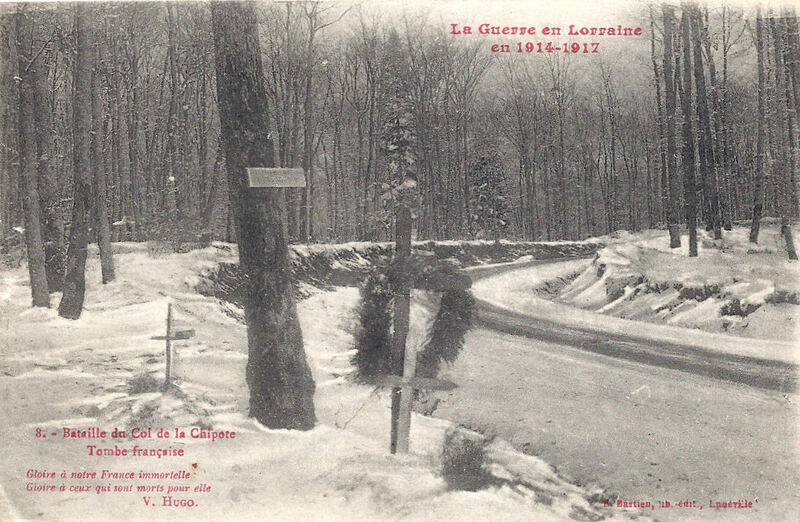 It was a vital crossing point between west and east in 1914, passing into French and German control several times. There is a nécropole nationale and a monument to the Chasseurs there.